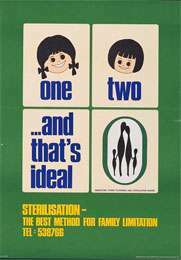 In the 1960s the Singaporean government encouraged women, especially uneducated women, to get sterilised following their second child. Population planning in Singapore spans two distinct phases: first to slow and reverse the boom in births that started after World War II; and then, from the 1980s onwards, to encourage parents to have more children because birth numbers had fallen below replacement levels. Government eugenics policies favoured both phases. In 1960s and 1970s, the antinatalist policies flourished. The Family Planning and Population Board (FPPB) was established, initially advocating small families but eventually running the Stop at Two programme, which pushed for small two-children families and promoted sterilisation. From 1969 it was also used by government leaders to target lowly educated and low-income women in an experiment with eugenics policies to solve social concerns. Government leaders also announced the Graduate Mothers' Scheme in 1984, which favoured the children of mothers with a university degree in primary school placement and registration process over the lesser-educated. After the outcry in the 1984 general elections it was eventually scrapped. Singapore had also been undergoing the demographic transition and birth rates had fallen precipitously. The government eventually became pro-natalist, and officially announced its replacement Have Three or More (if you can afford it) in 1987, in which the government continued its efforts to better the quality and quantity of the population while discouraging low-income families from having children. The Social Development Unit (SDU) was also established in 1984 to promote marriage and romance between educated individuals. Different sources have offered differing judgments on the government policies' impact on the population structure of Singapore. While Stop at Two has been described as basically successful or "over-successful", sceptics of interventionism claim that the demographic transition would have occurred anyway – noting that the government's attempts at reversing the falling birth rates due to the demographic transition have been less than successful. Family planning was introduced to Singapore in 1949 by a group of volunteers that eventually became the Family Planning Association of Singapore and established numerous sexual health clinics offering contraception, treatments for minor gynaecological ailments, and marital advice. Until the 1960s there was no official government policy in these matters, but the postwar British colonial administration, followed by the Singaporean government, played an increasingly important role by providing ever larger grants to the Association, as well as land for its facilities network, culminating in 1960 with a three-month nationwide family planning campaign that was jointly conducted by the Association and government. The population growth rate slowed from 4–5% per year in the 1950s to around 2.5% in 1965 around independence. The birth rate had fallen to 29.5 per thousand individuals, and the natural growth rate had fallen to 2.5%. 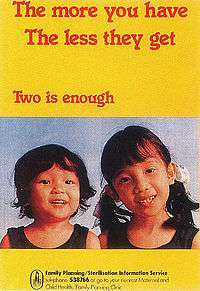 A historical poster from the widespread "Stop at Two" campaign, which created many posters across different languages that were displayed in schools, hospitals and public workplaces. The government created a large array of public education material for the Stop at Two campaign, in one of the early examples of the public social engineering campaigns the government would continue to implement (e.g. the Speak Mandarin, Speak Good English, National Courtesy, Keep Singapore Clean and Toilet Flushing Campaigns) that would lead to its reputation as "paternalistic" and "interventionist" in social affairs. The "Stop at Two" media campaign from 1970 to 1976 was led by Basskaran Nair, press section head of the Ministry of Culture, and created posters with lasting legacy: a 2008 Straits Times article wrote, "many middle-aged Singaporeans will remember the poster of two cute girls sharing an umbrella and an apple: The umbrella fit two nicely. Three would have been a crowd." This same poster was also referred to in Prime Minister Lee Hsien Loong's 2008 National Day Rally speech. Many other posters from the "iconic" campaign included similar themes of being content with two girls, to combat the common trend in developing Asian societies for families with only daughters to continue "trying for a boy". In 1986 the government had recognised that falling birth rates were a serious problem and began to reverse its past policy of Stop at Two, encouraging higher birth rates instead. By 30 June of that year, the government had abolished the Family Planning and Population Board, and by 1987, the total fertility rate had dropped to 1.44. That year, Goh Chok Tong announced a new slogan: Have Three or More (if you can afford it), announcing that the government now promoted a larger family size of three or more children for married couples who could afford them, and promoted "the joys of marriage and parenthood". The new policy took into account Singapore's falling fertility rate and its increased proportion of the elderly, but was still concerned with the "disproportionate procreation" of the educated versus the uneducated, and discouraged having more than two children if the couple did not have sufficient income, to minimise the amount of welfare aid spent on such families. The government also relaxed its immigration policies. In October 1987, future Prime Minister Lee Hsien Loong, then a young Brigadier General, exhorted Singaporeans to procreate rather than "passively watch ourselves going extinct". United Press International noted the "baffled" reaction of parents, many who had grown up in an era where they were told that having more than two children was "antisocial". One parent commented, "are we being told to have more children for the sake of the country or for ourselves?" Goh Chok Tong, despite the scepticism, remained optimistic that the population rate would restored to the replacement rate by 1995. An NUS sociologist however, observed that Singapore had "a new breed of women" – one "involved in their careers [and] used to a certain amount of leisure and more material possessions" – and hence would not be as receptive to financial incentives like previous women of the 1960s and the 1970s. As of 2011, Singapore's birth rate has not yet been restored to replacement level. Mothers with a third child would get 750 SGD in child relief (factoring historic exchange rates, this was about $662 in 2010 US dollars). If a mother had three 'O'-level passes in one sitting, she would qualify for an enhanced child relief rebate (lowered from a threshold of five passes). Having a fourth child would qualify for enhanced child relief of 750 SGD plus 15% of the mother's income, up to $10000 SGD. Channel NewsAsia reported in January 2011 that the fertility rate of Singaporeans in 2010 were 1.02 for Chinese, 1.13 for Indians and 1.65 for Malays. In 2008, Lee Kuan Yew, known for his remarks on the Malay community, said the below-national-average birth rate for the Chinese was a "worrying trend". That same year, he was quoted as saying, "[If] you marry a non-graduate, then you are going to worry if your son or daughter is going to make it to the university." ↑ Pekka Louhiala (2004). Preventing intellectual disability: ethical and clinical issues. Cambridge University Press. p. 62. ISBN 978-0-521-53371-3. ↑ Chadwick, Ruth (2000). Ethics, reproduction, and genetic control. Psychology Press. p. 165. ISBN 978-0-415-08979-1. ↑ Quah, Jon (1985). "Singapore in 1984: Leadership Transition in an Election Year". Asian Survey: 225. doi:10.1525/as.1985.25.2.01p0247v. JSTOR 2644306. ↑ Diane K. Mauzy; Robert Stephen Milne (2002). Singapore politics under the People's Action Party. Routledge. p. 60. ISBN 978-0-415-24653-8. 1 2 3 4 5 6 7 8 9 10 11 12 "Singapore: Population Control Policies". Library of Congress Country Studies (1989). Library of Congress. Retrieved 11 August 2011. ↑ Fred Pearce (2010). The coming population crash: and our planet's surprising future. Beacon Press. p. 130. ISBN 978-0-8070-8583-7. 1 2 Mui, Teng Yap (2007). "Singapore: Population Policies and Programs". In . Robinson, Warren C; Ross, John A. The global family planning revolution: three decades of population policies and programs. World Bank Publications. pp. 201–219. ISBN 978-0-8213-6951-7. 1 2 3 4 5 Toh, Mavis (24 August 2008). "ST: Two is not enough". The Straits Times. Retrieved 12 August 2011. 1 2 3 4 5 6 7 Wong, Theresa; Brenda Yeoh (2003). "Fertility and the Family: An Overview of Pro-natalist Population Policies in Singapore" (PDF). ASIAN METACENTRE RESEARCH PAPER SERIES (12). ↑ Yuen, Belinda (November 2007). "Squatters no more: Singapore social housing". Global Urban Development Magazine. 3 (1). 1 2 "Family Planning". National Archives. Government of Singapore. Retrieved 12 August 2011. ↑ Diane K. Mauzy, Robert Stephen Milne, Singapore politics under the People's Action Party (Routledge, 2002). 1 2 3 4 Mui, Teng Yap (1995). "Singapore's 'Three or More' Policy: The First Five Years". Asia-Pacific Population Journal. 10 (4): 39–52. Retrieved 11 August 2011. 1 2 Jacobson, Mark (January 2010). "The Singapore Solution". National Geographic Magazine. Retrieved 26 December 2009. ↑ "Poster Collection". Singapore Collection. Lee Kong Chian Reference Library. Retrieved 12 August 2011. ↑ "National Family Planning Programme – Stop at Two". healthcare50.sg. Retrieved 12 August 2011. 1 2 3 Chee, Soon Juan (2008). A Nation Cheated. ISBN 981-08-0819-4. 1 2 Webb, Sara (26 April 2006). "Pushing for babies: S'pore fights fertility decline". Reuters. Retrieved 11 August 2011. ↑ "SINGAPORE FAMILY PLANNING AND POPULATION BOARD(REPEAL) ACT". Singapore Statutes. Parliament of Singapore. Retrieved 12 August 2011. ↑ "Singapore – Government". Country Studies Program. Library of Congress. Retrieved 11 August 2011. ↑ Youngblood, Ruth (21 June 1987). " "'Stop at 2' Campaign Works Too Well; Singapore Urges New Baby Boom". United Press International. Retrieved 17 August 2011. ↑ "Department of Statistics, Singapore. Infographic on Crude Birth Rate" (PDF). www.singstat.gov.sg. Retrieved 4 August 2014. ↑ De Souza, Ca-Mie (17 August 2008). "Chinese community assured, new initiatives for Malay/Muslims". Channel NewsAsia. Retrieved 11 August 2011. ↑ "Eugenics in Singapore". Your SDP. 9 November 2008. Retrieved 11 August 2011. ↑ "Opening of Parliament". Singapore Parliamentary Proceedings. Parliament of Singapore.